Amnion and chorion are both present during a woman’s pregnancy and are part of the extra embryonic membranes that function in an embryo’s overall development. They also play important roles in the embryo’s nourishment, breathing, and seepage. The amnion is a thin but tough sac of membrane that covers an embryo. It is present in the embryo development of reptiles, birds, and mammals. However, it is not present in the development for amphibians and fish offspring. The amnion’s main purpose is to protect the embryo during the months of pregnancy. It helps reduce the risk of injuries to the unborn embryo and its development in the womb. Basically, the amnion is one of the defenses against any potential fetal damage during the developmental stages. Any injuries or harm can further lead to fetal death. The amnion has physical contact and is filled with a liquid known as the amniotic fluid. The amniotic fluid serves as a shock absorber for the unborn to protect it from any harmful or outside factors. The embryo lies in suspension within the amnion and the amniotic fluid. Aside from protection, the amnion provides a gateway to transferring nutrients and other essential necessities for the unborn embryo. The amnion is expandable and flexible in size as it tries to accommodate the development of the embryo to its later stages. The amnion is found on the innermost part of the placenta. It lines the amniotic cavity and holds the amniotic fluid and the developing embryo. The membrane is made up of tresodeum on the outside and ectoderm on the inside, which has specific cells with specific functions. The rupture of the amnion and the release of the amniotic fluid signal the start of the pregnancy’s delivery stage. The chorion, on the other hand, is the outer membrane that surrounds the amnion, the embryo, and other membranes and entities in the womb. It is considered as the support platform of the fetus and the amnion. It is present in the embryo of reptiles, birds, and mammals. In mammals, it contributes to the growth of the placenta. Two layers form the chorion – trophoblast as the outer layer, and mesoderm as the inner layer. The mesoderm is the one in contact with the amnion. The trophoblast provides the nutrients for the fetus during its confinement, while the ectoderm further develops into many parts of the embryo’s body, like teeth and the nervous system. The chorion provides additional protection for the embryo, but it also promotes the exchange of nutrients and other necessary fluids between the mother and the embryo. Additionally, the chorion has a special feature called chorion villi. The villi sprout from the chorion in order to reach more maternal blood, the main fluid that carries nutrients from the mother’s food to the embryo. They also serve as a fence between the fetal blood and the maternal blood during the time of fetal development. 1.Both the amnion and the chorion are extra embryonic membranes found in reptiles, birds, and mammals. 2.The amnion is the inner membrane that surrounds the embryo, while the chorion surrounds the embryo, the amnion, and other membranes. 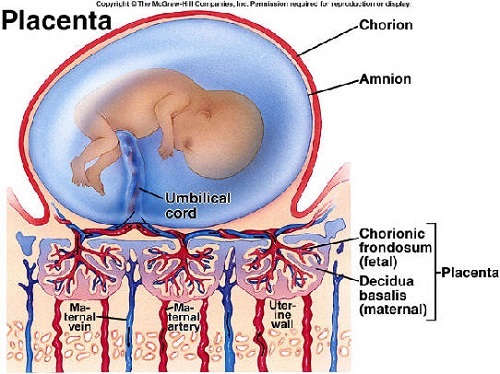 3.The amnion is filled with amniotic fluid that holds the embryo in suspension, while the chorion also acts as a protective barrier during the embryo’s development. 4.The amnion is made up of tresodeum and ectoderm, while the chorion includes the trophoblast and the mesoderm. 5.The chorion has a special feature called chorion villi, which acts like a barrier between maternal blood and fetal blood. It absorbs maternal blood for the embryo’s substance and other necessities, while the amnion plays a part in the delivery stage. The rupture of the membrane is a signal that the fully formed offspring is ready to come out of the womb. Difference between gestational sac and yolk sac? Celine. "Difference Between Amnion and Chorion." DifferenceBetween.net. February 26, 2018 < http://www.differencebetween.net/science/health/difference-between-amnion-and-chorion/ >.